New York—With tensions at a fever pitch and TV viewers from Laos to Lapland glued to their sets, the Occupy Wall Street protesters won a last-minute reprieve Friday morning from the Bloomberg administration’s demand that they vacate Zuccotti Park for a clean-up. From viewing fragmentary photos and glancing at the headlines, the uninitiated might imagine that this spot was a pristine green sward before the protests. Not a chance. Devoid of natural beauty and not surrounded by any obvious symbols of capitalism (unless you count Brooks Brothers), this narrow, block-long open space boasts all the charm of a strip-mall parking lot. The fruit of a real-estate deal that dates back to the troubled era when John Lindsay was mayor and New York was laughingly dubbed “Fun City,” Zuccotti Park is an unlikely setting for anything—let alone the purported rebirth of the American Left. Nothing about Occupy Wall Street is what it seems. Sure, the month-long protest has launched more passionate theories than any event since the publication of Freud’s The Interpretation of Dreams. With opinions so polarized, even at The New Republic, the smallest fragment of description can be interpreted like a political manifesto. Nothing riles the demonstrators camping out in Zuccotti Park like the (inaccurate) charge that they are unwashed, shiftless hippies. Instead, after three days of following the protests (and no, that does not make me an expert), I came to a different conclusion. What struck me was the sincere and good-natured smallness of it all. WANDERING PAST POLICE barriers as I walked from Trinity Church to Zuccotti Park on Columbus Day, there was as much energy coming from a four-block-long and totally apolitical street fair as I detected at the protest site. Okay, the revolution will not be won with funnel cakes. Still, a Tuesday afternoon Millionaires March up Park Avenue past the apartment buildings of the likes of Jamie Dimon, the CEO of JP Morgan Chase, attracted about 500 mostly middle-aged, union-affiliated demonstrators. And in late Wednesday afternoon’s drizzle, 400 temporary residents of Zuccotti Park tried to march the roughly eight blocks to Wall Street. How do I convey this respectfully as a veteran of the 1960s? This is not the 1967 Pentagon March or anything like it. Nothing I saw in New York this week justifies the current level of the-whole-world-is-watching media coverage. At times in Zuccotti Park, there seemed to be almost as many reporters (many of them from foreign news outlets) as overnight campers. During the first full week in October, according to the Project for Excellence in Journalism, one-third of the overall coverage of the economy centered on the Wall Street protests. That seems as wildly out of whack as all those months when only a lonely band wrote about income inequality in America. The mystery that will launch a thousand media seminars is: How did a modest encampment in Zuccotti Park morph in less than a month into a global news story? “At the beginning, this protest seemed fairly small,” said Blair Taylor, a 35-year-old, working on his Ph.D. in political science at the New School, who has been visiting Zuccotti Park since the onset of the protest. “Originally, there was a lot of right-wing sentiment—9/11 Truthers and Ron Paul supporters. Now it’s much more left-wing.” That was certainly my impression at Zuccotti Park as I interviewed at random an herbal beverage brewer from North Carolina; a 55-year-old historian of feminist art and magic who lives three blocks away; a sculptor from suburban Westchester County; and an unemployed construction worker from Staten Island who acknowledged, “These problems are going to take years to fix. It won’t happen overnight.” Maybe I would have come up with something different if I had not conspicuously avoided everyone with large, visible tattoos or a manic glint in their eyes. My very tentative theory about the media success of Occupy Wall Street begins with the cleverness of the initial concept. Even if no one whom I interviewed at the protests had seen anyone even remotely responsible for the economic meltdown, it is easy to imagine that the demonstrators were confronting Goldman Sachs partners and hedge-fund managers daily on their way to work. 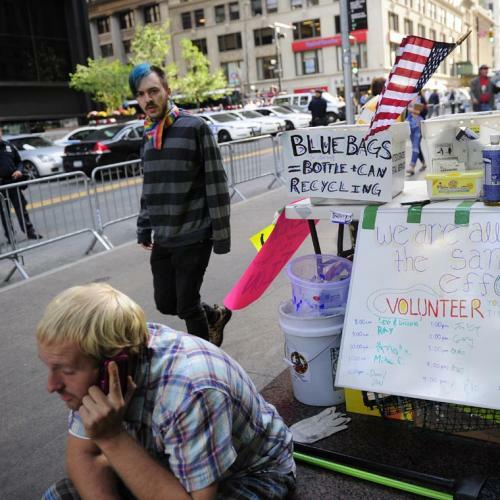 Occupy Wall Street has a much more dramatic ring than Camp-Out in Lower Manhattan. Another major factor was the way that the normally astute New York Police Department fanned the movement with their indefensible use of pepper spray and their initial penchant for mass arrests. When you are trying to create a mass movement, it is way better to be martyrs than ignored. The final aspect is that the Occupy Wall Street protests filled in a missing piece in the political puzzle. Mark Schmitt shrewdly suggested that liberals had long been fantasizing about a Tea Party of the left. But I also think serious journalists had been waiting for some bellow of outrage over the way that Wall Street plutocrats had been laughing all the way to their annual bonuses. Why in popular culture is Bernie Madoff a more notorious symbol of greed than AIG or the bankers who packaged sub-prime mortgages? Someone in America had to get mad other than Elizabeth Warren. So when the demonstrators with their amorphous sense of injustice arrived in Zuccotti Park, media stars were born. Occupy Wall Street is a Rorschach Test. If you are a true believer of the left, you can find something appealing in the well-intentioned and mostly well-behaved efforts of the protesters to call attention to economic injustice. If you are a hard-core conservative, you can mock the demonstrators as easily as you can pillory a vegan food co-op. What happens to this fragile-as-a-soap-bubble movement in the future is impossible to predict. But it is unlikely that the answer will ever be found in Zuccotti Park or the next destination for Occupy Wall Street. 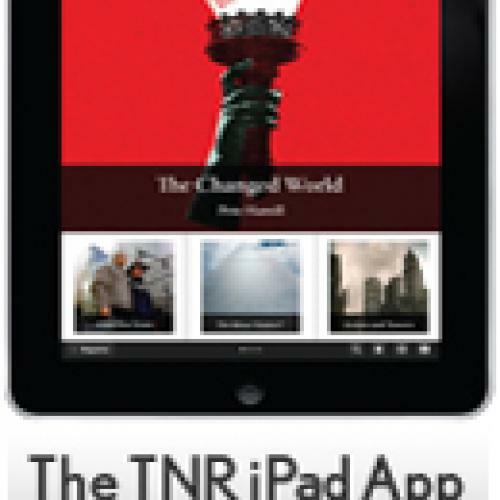 Walter Shapiro is a special correspondent for The New Republic. You can follow him on Twitter @waltershapiroPD.